A research report by Knight Frank notes that Nairobi has about 470,000 square meters of shopping center space under development underway and is one of the five largest cities in Africa (excluding south africa) in that regard (it currently has 391,000 square meters of shop space). 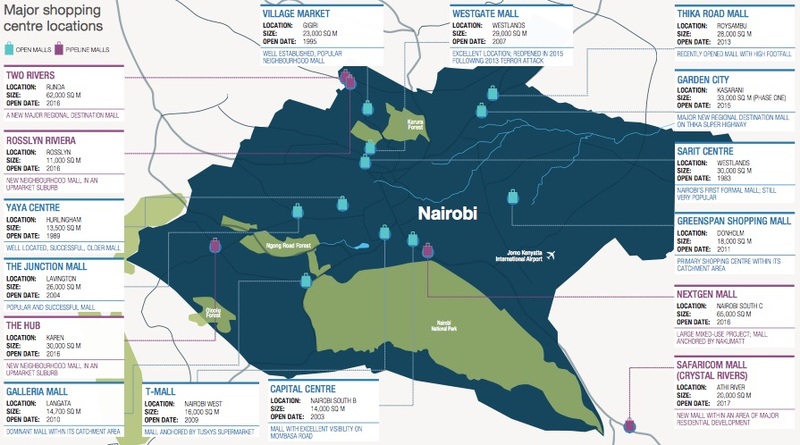 Knight Frank notes that, aside from Actis (the pioneering UK investor), most of the developers and landlords of Nairobi’s shopping centres are local Kenyan property owners. A second Buffalo Mall is to be built in Eldoret. This comes after the Pivotal Fund acquired 50% of Buffalo Mall Naivasha. (The) Game operated by Massamart. in which Walmart has a majority stake, opened at Garden City Mall as the anchor tenant. 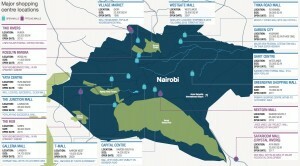 Khetia: are in the midst of a Kshs 1 billion expansion in western Kenya. They plan to open up stores in Kisii, Busia and Kericho, each of which requires Kshs 200 million. Nakumatt: Just launched their 59th branch in Kakamega – the Nakumatt Midtown Supermarket. It was remodeled after nakumatt acquired three supermarket stores in Western Kenay (Kakamega, Bungoma, Busia) from Yako Supermarkets in a Kshs 260 million investment program. They have also added new stores like Sports Planet departmental at the reopened Westgate mall. Naivas The ownership of widely admired chain is subject to an inheritance court case. Sarit Center: Nairobi’s first formal mall is undergoing an expansion program to add more stores. Society Stores: An offshoot of a Khetia family member – Trushar Khetia, hopes to grow the store brand. He says that they had the first chance to buy out Ukwala, but it wasn’t backed by the board and the deal fell through. Two Rivers backed by Centum and built by Avic will also house a Carrefour store at the 62,000 square meter site in Ruaka that sits on 100 acres. Tuskys: is focusing this year on staff welfare and streamlining customer service delivery through deployment of digital platforms for e-commerce. Shareholders are also trying to settle issues in readiness for a listing at the NSE by 2018. Uchumi: Is under new management and, once again, in search of a restructuring deal that involves working with suppliers, sale of assets (such as Ngong Road and Langata branches) and a share sale to a new anchor investor for about Kshs 5 billion. This has been complicated by some suppliers who sued to wind up the company, but talks are ongoing with the government, and it appears that majority of the suppliers will agree to convert Kshs 1.8 billion of the dent owed to them into equity at Uchumi. Ukwala was bought by Choppies of South Africa. The deal was completed after an tax agreement deal was reached with the Kenya Revenue Authority who were demanding back taxes from Ukwala. Ukwala had admitted to owing the taxman Kshs 101 million, but appealed the additional Kshs 845 million that KRA was demanding. Finally, suppliers, have complained about delayed payments by supermarkets retail chains. This was highlighted in letter from the Kenya Association of Manufacturers (KAM) to Tuskys, Nakumatt and Naivas. This entry was posted in actis, Centum, Investing in Kenya, Kenya taxation, KRA, Nakumatt, SME solutions, Uchumi on May 19, 2016 by bankelele.